US takes northern Syria - ISIS strategy pays off. How much was it? 4 weeks to take Baghdad? 4 years to take Raqqa. Because US Armed Forces >> "Syrian Democratic Forces". Has the U.S. and the Syrian Democratic Forces won the ideological war and eliminated the factors that made ISIS and similar groups possible ? Is there now a viable alternative other than jihad to attract young people with nothing else to live for, or to join and fight for ? Odds on how long ISIS/ISIL regroups and pops up again ? Anyone paying attention to the troop build up in Africa ? The headline should say "US flattens Northern Syria -- We had to destroy Northern Syria in order to save it" (the preceding is a reference to what the US did to villages in Vietnam during the Vietnam war). 17 strategic fully functional levels.....count em. Because Saddam was more dangerous than ISIS? Huh? What does one have to do with another? Roflol. Sure right. After all major military campaigns happen right now when someone snaps their fingers. They don't take years of building up and training the Syrian Democratic Forces and years of fighting step by step. I can see why you only can communicate in pictures. 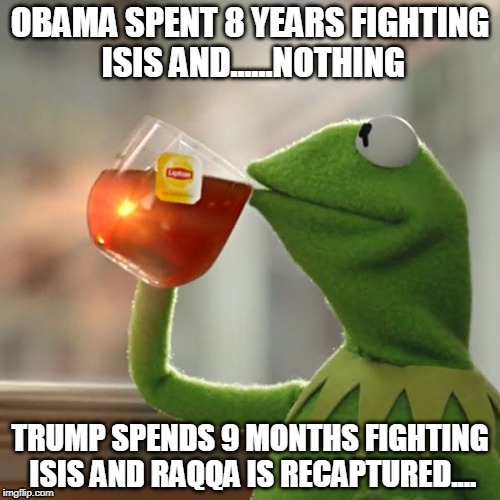 The first 3-1/2 years of Raqqa were under ball-less Obama. How many Red Lines did Obama draw?